This week's product pick is unrelated to skin care but has EVERYTHING to do with personal appearance. Grooming your facial and body hair is essential to maintaining a well-kept look and this tool will make things a heck of a lot easier! It's cordless, rechargable, has 6 different attachments, a stand that keeps everything organized and it is downright perfect! 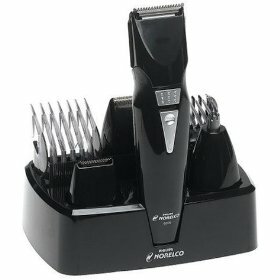 I use this shaver/buzzer/trimmer almost everyday and if it ever broke, I would buy the exact same model. Other than using this trimmer to shorten my facial hair before a shave, I routinely use it to trim my sideburns, man-scape (oh yea, I said it! ), and even to give myself a pretty decent hair cut. Not to mention it is totally affordable!